Sitting behind the wheel of the new 2018 Genesis G90 gives drivers and passengers new found respect for the road. Even at high speeds, the G90’s exceptional agility and stability offers you a refined ride and dynamic driving experience. 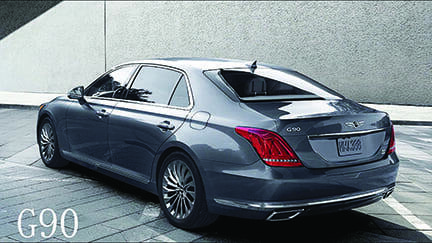 The 365-horsepower V6, sophisticated dual-mode drivetrain, and Genesis Adaptive Control Suspension assure you stay as connected to the road as you are to the G90. It doesn’t matter how beautiful, efficient or stylish an auto may be, drivers still have to contend with potholes, speed bumps and just bad roads. But thanks to Genesis’ Adaptive Control Suspension was developed to help maneuver through critical road elements by reinforcing steering stability and improves collision avoidance during unstable conditions. The G90’s Intelligent Drive Modes helps to adjust for road conditions. This feature offers an optimal drive mode by sensing and learning real-time road conditions as well as driver behavior, then appropriately modifying throttle response and transmission shift points. Once inside, occupants are treated to supple and comfortable premium seating and natural custom stitched, full-grain Nappa leather seating. Everything inside has been thoughtfully designed for your utmost comfort and convenience. The G90’s driver seat has been approved by the back and spine specialists at Aktion Gesunder Rücke, the German campaign for healthier backs. Ergonomic cockpit design puts every control within easy reach while providing a clear view of all displays. Skillfully designed with complete respect for the human body, the G90’s 22-way adjustable driver seat contours around you to provide the greatest comfort, with support precisely where you need it. As you’re cruising behind the wheel, the driver and occupants are surrounded with double laminated soundproof glass and 3-layer door seals block outside noise and vibration providing an exceptional level of peace and quiet. But once the music starts, you’re surrounded with a 17-speaker system, featuring LEXICON® 7.1 SURROUND.SOUND AUDIO.